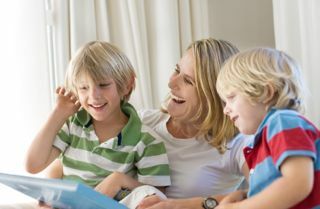 When your child is learning to read, or striving to improve their reading, practice really does make perfect. During term time children spend a lot of time practicing and improving reading skills. There is a risk that some of this hard work will go to waste with the onset of the long vacation unless your child keeps reading throughout the holidays. According to research on this so-called 'summer slide', a typical student can lose about one month of learning during the summer months, with disadvantaged or struggling students losing even more. Efforts to make up this loss during the school year alone may not be successful. With this in mind I decided to set about making sure my children and I planned extra reading time into each day. I explained to my sons that during the holidays we were going to do extra reading each day and we could all come up with some fun ideas for where this extra reading was going to happen. I said that either I could read aloud to them, or they could read to me - whatever we wanted. The important thing was that we were reading in some way. 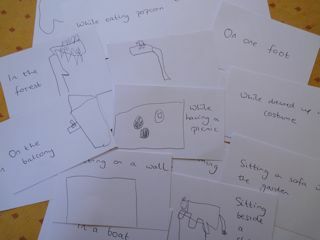 I started the ball rolling with "On the trampoline" and "In a boat" and wrote these down on index cards. Then I asked the boys, "Where do YOU want to read extra books during the holidays?" 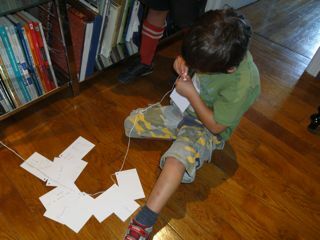 I gave them each a pile of index cards on which they could write down or illustrate each idea. They were both really eager to think of ideas, although not so into writing the cards for them. My younger son was happy to come up with suggestions but didn't want to draw or write anything so I transcribed the ideas for him. 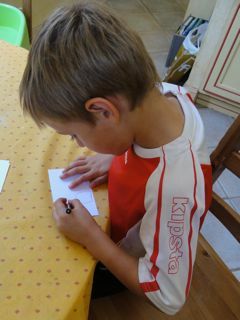 My elder son wanted to draw his ideas but asked me to write down the words for him. Fair enough. I would have preferred him to practice his writing but this was supposed to be a fun activity to get us all thinking about reading, so I let it pass. Some great ideas emerged - "While having a picnic", "On the balcony", "Sitting on a wall", "On one foot" (that will have to be a short book! ), "While eating popcorn" and "In a den in a forest". Once we had exhausted our ideas we punched holes in the corner of each of the cards and then the boys threaded the cards onto two pieces of string. 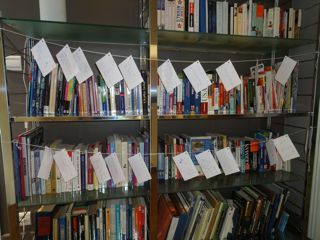 I then tied the strings across the bookshelf so the cards hung down in full view. Immediately my eldest pulled off one of the cards to use that day: "While dressed up in costume". We all (yes, me too), got changed into costumes and I read aloud to them for 20 minutes, or so. Each day of the holidays the boys will choose a new card and rip it off the string. That is where we will do our extra reading for that day. 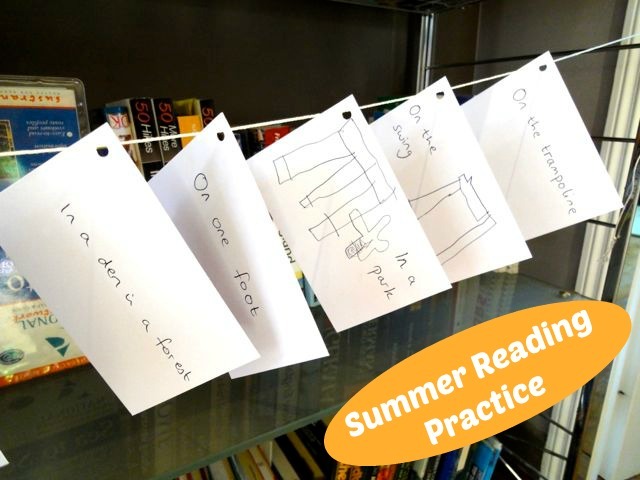 Check out these books lists for ideas of what to read during your summer reading practice. As well as being a great way to keep reading time interesting, seeing the cards hanging on the bookshelf serves as a constant reminder to make sure we build that extra reading time into each day. You can find more ideas here for encouraging your children to read and therefore become better readers.